Sean E. Bones has been tattooing since 1999 and currently runs Tattoo By Design in Irving, Texas. Like any other artist, Sean has some definite ideas about the current state of tattooing. 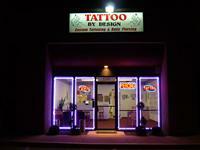 LoveToKnow (LTK): Tell LTK readers about yourself and Tattoo By Design. Sean E. Bones (SEB): I am a bit of a weirdo. I don't like being around large crowds of people and prefer tattooing to just about anything else in the world. So, I spend the majority of my time at the shop working. Tattoo By Design was established in March of 2006 as a partnership between Joel and Susan Fox and Lyle Valentich, who still owns Tattoo Body Works in Stephenville, TX. Lyle sold his part of the business a couple of months ago. It is now run by me and owned by Joel and Susan Fox. We have two part time artists that help on the weekends. My wife, Mari, handles all the piercings and is almost finished with her tattooing apprenticeship. LTK: How long have you been a tattoo artist? SEB: Off and on for over 7 years. I've been working steadily at a shop for a little over three years now. LTK: What made you interested in tattooing? SEB: I grew up in El Paso, TX, where tattoos and being tattooed are common. Being a musician as well, I have been around tattoos and tattooing all of my life. I "picked" designs on my friends as a kid, but pursued music as a career at that time. I got several homemade tattoo jobs by the time I was 13 and was driving my parents up the wall. I finally decided that I could do it better than the people who were around at the time and kind of took it from there. It wasn't until years later that I got the proper equipment and training on how to use it from Troy "Rabbit" Fox, Lyle Valentich and Kevin Ingram. I see the act of tattooing and getting tattooed as a spiritual energy exchange, and as something that should be taken with the utmost respect on both ends. People tend to get tattoos at turning points in their lives, whether they're good changes, bad changes or just remembering someone or something that is now gone. My father, who recently passed on, was extremely proud of the strides I have made in my own art over the past three years and was always very encouraging. I dedicate the rest of my career to his memory. 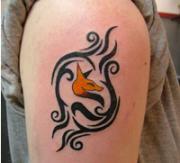 LTK: What was the most interesting tattoo you've done? SEB: A customer from Oklahoma brought me a design I think was called "Trip to the Moon." The image was very difficult to translate to skin, but the end result was pretty cool. I'm interested in every tattoo that a customer brings me. A lot of artists these days seem to think it has to fit their own criteria for what is cool or deserves their time. I think that is a load of crap. It's not for the artist, it's for the customer. That is a whole other debate, I suppose. LTK: Is there anything else you'd like to share? SEB: I think that the sacred art of tattooing is taking a beating every day by "rock star" tattooists who think that their poop doesn't stink. I think things are getting close to the saturation point, and I cannot wait for the fly-by-night shops that are popping up on every corner and pumping out bad tattoos to go away. Eventually, the industry will right itself and go back to what it was, what it is and what it should be - a sacred art form that transforms the person getting the tattoo as well as the person giving it. Lastly, if you are looking for a world class tattoo or piercing, come by Tattoo By Design and let us show you what we can do!